Miniature Market has two preorders up for TMNT Dice Masters. There's a "box set" for $24.49 and a "tin set" for $27.99. Do we know if the contents of the package are different or if it's just paying extra to make it harder to store? $35 regular price? clearly it's not the same contents as the starter box for the other sets. which isn't a bad thing. If I pay for the cheaper one instead of the tin case, would I be getting Turtles that were in only half a shell? If there were some details on the difference I'd go ahead and pre-order just so I don't forget to do it later. My guess is...one is a cardboard box...the other is a "special limited edition collector's Tin Box"...kinda like a cookie tin. They probably both contain the exact same thing. It'll be interesting to see how large the set is. Personally, I'm just thrilled that it'll cost less than fifty bucks. Well, the regular price (35) is over double that of a starter(15 for most sets). A starter has 34 cards, if we assume they double up we can expect around 70 cards. -10 for BACs, that is 60 character cards, 60/3 = 20 = 20 characters? Seems reasonable. The extra 5 dollars would go toward the extra manufacturing costs and some of it would be dice obviously. I could see it being something like 20 characters with 3 cards each and 10 BACs. I was going by that $24.99 posted originally, and I'm in Canada, so I'm used to paying $18-20 for a starter. Don't forget dice. We will probably see max dice for each card, so that will factor into the cost. 15 characters would be about half a set. And, I expect the cheaper box option will be in a standard Collectors Box. Splinter taught them to be ninja tins? 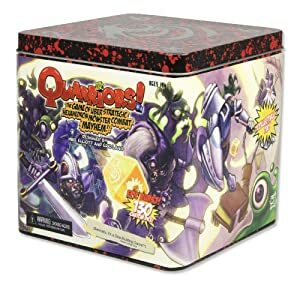 What does the inside of the quarriors tin look like? Does it have spots for things or does it just have things piled in it? It better be shaped like the Turtles Van. My predictions. This marks a slightly higher price point. ~15-20 characters (same as others are guessing). Contents not quite identical so you need both to get every card. Getting both gets you Max Dice, as does getting 2 of either set. I'd be really annoyed if they make it so it's a "non-collectible" set, but still don't release everything in one package, even if it costs $50-$75. I just want to know I'm getting everything if I'm going to not just be buying the set off of eBay so that I am guaranteed everything, with no duplicates, for cheaper. They'd have to literally label the different sets A and B so that you don't risk buying the same one. There's no way that the premium has half the cards and dice, and the regular has the other half, that's for sure. I'm assuming the premium has some alt-art cards, maybe some more cards, and different colored basic action and sidekick dice, along with a more interesting container. Either way, I'm assuming a full set is probably going to be in either one, because if those are the only types of sets released, they wouldn't make you buy a regular starter, and then a premium starter to get all of the same cards - that's ridiculous. The premium starter is basically the big tin with the mat and alt-art and different colored basic action/sidekick and booster packs, as opposed to a regular starter, but without the booster packs (since it's all just one set so any boosters would be silly) and maybe something else added. However, there's no way that they make a "box set" and a "tin set" and split the set into two. That would literally lead to me going to eBay and completely bypassing buying any product straight from a Wizkids supplied store. It wouldn't make sense. My biggest guess is that the tin set is more for collectors and newer people. @Indy Mon I want to see those dice! Now I am gonig to be disappointed if they DON'T have those dice. LOL. I'm ordering both, and playing one set with the kids. Booyakasha! Only one thing matters here. Are there new dice masters things in there? If yes, then it's already excellent, take my money.